Vacmaster VWM510 Wall Mount Wet/Dry Vacuum is a great investment for anyone that’s looking for a reliable and solid unit that’s compact enough to mount anywhere in the house. You can keep it in your garage and take care of any DIY-related mess, or store it in your kitchen so it’s easy to grab when you want to clean up different parts of the house. There’s a lot to like about this vacuum, including the remote control feature which allows you to manage all of its settings from a distance, and the ergonomic handle that makes life easier when moving the unit around. It’s worth noting that the Vacmaster VWM510 comes fully equipped with all the components you need to mount and use it. This makes it ideal for new vacuum owners. If you’re thinking of buying this fantastic vacuum, read on for more information on its features and how it works. Vacmaster has added a 5 peak horsepower (HP) motor to this unit with 2-stage functionality. With a motor this powerful, it’s a wonder how this vacuum is able to deliver excellent results without making a sound. In fact, the noise levels on this model can only go up to 74 decibels, and that’s when it’s running both wet and dry functions. Vacmaster really pushed the innovation button when it comes to the functionality and design of this wet/dry vacuum. On the handle is a remote control that allows you to switch the unit on and off from afar without requiring you to be close to the unit. The VWM510 comes with a detachable blower which scores the unit major points in the convenience department. This feature allows you to blow leaves away without dragging the tank with you. On top of that, there’s a long blower tool that improves your ability to focus the wind, enabling you to blow leaves and debris away from your driveway faster and more efficiently. You’ll be glad to know that unlike most models, this detachable blower is easy to use and comfortable to handle. Plus, the fact that this vacuum comes with a leaf blower means you won’t have to use a different device when you need to clear up your driveway or passageway. This wet/dry vacuum cleaner from Vacmaster is equipped with sturdy and swivel-friendly wheels that allow you to move the unit around smoothly on different surfaces. This feature will come in handy when your vacuum is full and you want to transport it from one space to another. As if that weren’t enough, the Vacmaster offers complete portability with two ergonomic handles on either side. These handles are ideal to use when you want to take the vacuum upstairs and they’re safer than the top handle which comes with the risk of releasing the blower. This vacuum doesn’t take up a lot of space at all. You can place it in your garage or your basement without thinking too much about where to fit it in. In addition to its compact size, it easily mounts on the wall. This widens your placement options so you can either mount it or move it around on the ground as you like. 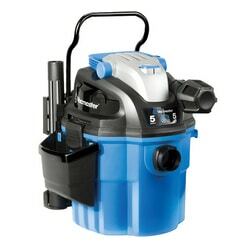 This vacuum is designed in such a way that it has a massive drain port at the bottom that makes it easier to drain water from flooded floors, for example. It also simplifies the process of draining the water afterward because you only need to open the drain and the liquid will flow out on its own. Since it has a large diameter, the drain port has a liquid capacity of 5 gallons and it can drain that amount of water within a minute. If you like, you may even attach the drain port to a drainage channel. The Vacmaster VWM510 comes with a wide range of accessories to help make cleaning easier, including brushes, wands, and hoses. Plus, you don’t have to wreck your brain trying to figure out where to place the accessories because each comes with a dedicated storage point on the vac. The VWM510 model has mostly positive reviews, with most consumers saying that it not only looks good but it works like a charm too. Many were impressed by the machine’s heavy-duty construction as well. But it appears that this vacuum is not all that perfect because there were a few complaints about the hose attachment, which is flexible but flimsy. There have also been reports of missing filter retainers but that has more to do with the distributor than the manufacturer. Overall, this is a good quality machine that gets the job done. That’s why it’s so popular amongst homeowners that want a quiet yet effective vacuum that will last them for more than a few years. The air/noise diffuser was a huge hit because it enables you to use the vac even during no-vac times, which is good news for anyone that lives in an apartment complex, for example. The Vacmaster VWM510 may be small but it packs a punch with powerful performance, and it’s ideal for use in residential applications. In addition to keeping your garage clean, this vacuum comes with multiple attachments including a hose and drain that you can use to completely remove water from a flooded basement or another area. The only disadvantage to owning this vacuum model is that you have to figure out how to store all the attachments. The best place is to keep them in the box and you’ll be able to enjoy all the fantastic features it comes with.